The Kentucky Derby is always one of my favorite days of spring. While I’ve admittedly never attended the actual Derby (one of these years I’m going to finally make the trip! ), I’ve gone to my fair share of Derby parties over the years. What’s better than dressing up in your springtime finest (and preppiest! 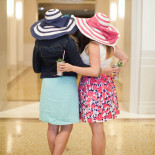 ), donning an oh-so-chic hat, and drinking Mint Juleps with your guys and girlfriends?! Mark your calendars if you haven’t already… Not this weekend, but the next — May 7th! While I’m all for getting a dress specifically for the occasion (remember this post last year? ), it’s nice to be able to shop your closet or pick up a dress that you’ll be able to wear over and over again, too! I recently got this dress (and blazer!) from Draper James, Reese Witherspoon’s clothing line. I’ve heard the boutique in Nashville is absolutely adorable, but until I get to Nashville… Online shopping it is! They’ve got so many cute finds on the site… great gifts (Mother’s Day is the day after the Derby!) and a ton of feminine frocks with a southern spin. And somehow by impeccable timing, today is the last day of their huge online sale — up to 75% off! Both my embellished dress and scalloped blazer are on major sale! But back to Derby dressing… It’s nice to have dresses in your closet that work for a variety of occasions! 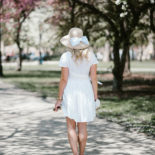 I paired this LBD with a fun scalloped blazer and a wide brim hat for a look that’s Derby-Day-Approved, but you could easily ditch the hat and swap the sandals for a classic pair of pumps and you’ve got yourself an office-appropriate look. Or swap the blazer for a jean jacket and add a pair of ballet flats or white sneakers for the weekend. 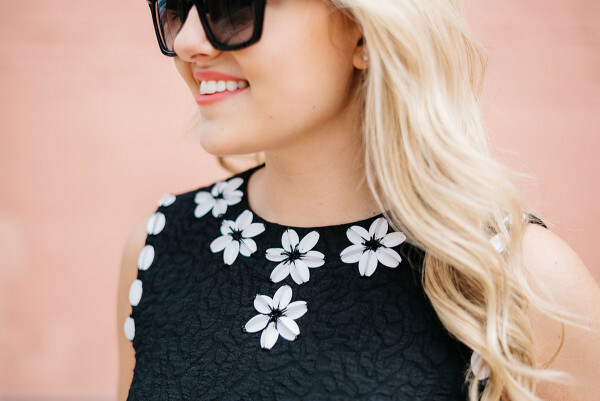 Options are endless when it comes to LBDs! I absolutely love this little black dress! The pretty white embellishments at the neckline make getting dressed easy, no statement necklace needed. The texture is so pretty, too! Oh and did I mention it has pockets? It has pockets!! What are your plans for the Derby this year? I’m still figuring out what to do for the day… Kind of toying with the idea of having a little get-together on the terrace at my apartment building because there’s an outdoor TV… TBD! Love the details of your blazer and those heels are so cute! Looking flawless in this sophisticated and feminine outfit! Your dress is absolutely amazing! Can I just steal this entire outfit?! I’m obsessed with every piece! So cute! I love the little black dress and the hat. Nice Blazer too. I can tell that you love those high heel sandals. I think those shoes are your go to sandal for the summer. That dress is the absolute cutest and so perfect for the Derby! Also, I’m obsessed with those heels and have been lusting over them for forever! Love the scallop hem detail! You look adorable! Loving the hat and I’m always a fan of black and white looks. Look the look! How did you find Draper James sizing? I’ve been thinking about ordering but hate having to pay for return shipping. Oh my gosh, that scalloped blazer! It is just gorgeous, I love it! I especially love how you paired it with the dress & lace up heels. This outfit is 100% race ready!